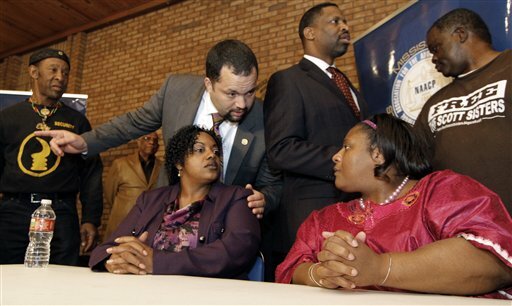 National Association for the Advancement of Colored People National President Ben Jealous, left, listens as Jamie Scott cries while speaking about she and her sister being released from a Mississippi prison after serving 16 years for armed robbery during a news conference in Jackson, Miss. Empowerment and enlightenment were the consistent themes of the NAACP’s 4th Annual Conference on Criminal Justice at York College on Saturday October 25th. The conference workshops focused on community action and response to the conditions that incarceration creates for society as a whole. Wanda Best DeVeaux, committee chairperson for the prison project, has been heading these conferences in hopes that residents and community activists will have an impact on state legislation. “Your congressman, your senator, representative, or whoever is establishing these forms of punishment in your name,” he said imploring the audience to make legislators accountable for prisoner treatment and its consequences. “It doesn’t take a whole lot of money, just an investment of your time,” she told audience members asking what they could do individually to help minimize the stress of their absent parent. Things as simple as “What children of incarcerated parents need most are consistent, dedicated adults in their life,” she said. Fellow presenters Kathy Boudin and Jean Coaxum praised the programs available to foster relationships between children and their mothers while in prison, “They [the children] know we did something bad, but they can also see our strengths and that we’re getting better,” said Boudin. The conference ended with Tiffany Wright and the Violence against Women Committee, Correctional Association of New York. Wright recited a poem by an unknown author entitled “He Gave Me Flowers Today” detailing the severity of domestic violence on daily life. Their presentation promoted legislative change on behalf of battered women. “The purpose is not to focus on the problem of domestic violence but to give you solutions,” she said. Best DeVeaux was pleased about the crowd the conference drew and urged everyone, especially the community residents to advocate for change, “If you’re a resident of one of the seven neighborhoods that populate over 80 per cent of the prison system, you need to ask your officials about incarceration,” she said. Rutgers Hosts "Behind Bars: The Impact of Incarceration on Women and Their Families"